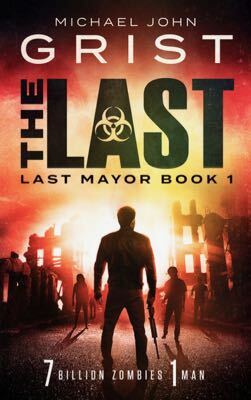 The Last is Book 1 in the Last Mayor apocalypse thriller series. 7 billion dead. 1 man alive. When the apocalypse hits America, not a soul is left alive. He’s alone against 7 billion of the dead. A blistering take on the end of the world and one man’s ingenious struggle to survive, with a twist that’ll rip off your head and eat your brains. See the evolution of the book cover and marketing package. More please! Cerulean’s story!? A sequal! ?Just more!!! Thank you for your interest Mistina! I’m about two thirds of the way through the sequel. It should be coming out in about two months- join my newsletter to hear exactly when :). Great read! Can’t wait to dig into another! I couldn’t put this down! Great great book, I loved it. I am so glad I read this book on Kindle. I thought it was a fun read. So many books on Kindle are dreadful. Poor spelling, poor grammar, poor syntax..just poor. But This novel was a rich delight. Not an apostrophe or comma out of place. Thank you, Mr Grist for making the zombie genre fun again! Thanks Kathy, I’m very glad to hear that- I hope you enjoy the rest of the series. Loved the Last! I enjoy zombie books and have to admit I am getting tired of the same old, same old story lines. The Last takes a whole new twist on the zombie apocalypse, great characters, suspense, twists and unexpected turns. This was so good that I continued on to The Lost, The Least, The Loss, The List, The Laws and now I am reading The Lash. OMG! Never saw any of the situations coming. Very Inventive, smart, and makes you think. Thanks for the great stories, appreciate your hard work and imagination! Thanks Elaine! Very kind comments, really appreciated. Book 8 is coming! Hi loved the book when will book 8 be released? This is what I consider to be a “fun, fast read.” The story was interesting and the book was well written. Reading it allowed me to escape in to the world of zombies. A few times I even laughed out loud. Recommend this book to your friends. I love zombie/apocalyptic stories and this series is one of my favourites. Turns zombie folklore on its head and the lead characters are so relatable. I’ve read and re-read these books 3 times already. I guiltily want the world to continue to challenge our heroes yet long for a happy ending just so I can keep reading about it! Thanks for a great read MJG ? I absolutely loved this book. When it comes to zombies, you get all my attention. I have also read most of the secondary books. Although Zombie-books normally aren’t my genre I really enjoyed the book and finished it in one-go! The same was with the Saint’s Rise. Very entertaining and captivating!